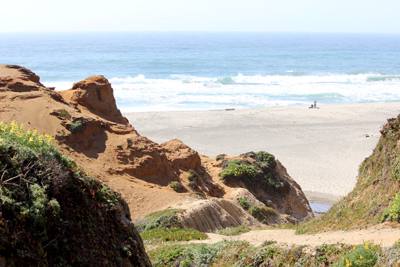 In mid-May 2013, we took an 8-day Northern California road trip with our family, ages 6 to 69. The hours with Google were not wasted since the whole trip went relatively smoothly. We've chronicled our experiences in the following posts to help out any other families that may be considering a similar trip! First, we did San Francisco in 36 hours! 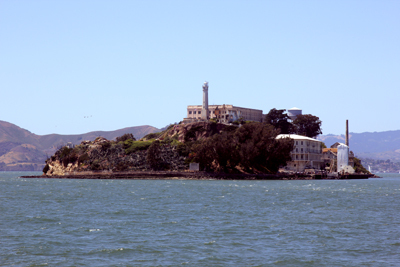 It involved a lot of walking, but we covered important highlights like Pier 39, Alcatraz and the Golden Gate Bridge. Next was the North Coast for 2 days before heading across the mountains to stay in the Shasta Cascade region. Finally, we wrapped up the week with a visit to Napa Valley which was admittedly a challenge to plan since we had 3 minors in our group. Since the trip was enjoyed by everyone, we thought we'd share our route and stops in case it can be helpful to others. Three in our party of seven were minors which made planning for our Napa Valley trip a bit challenging. We asked friends who'd travelled to the area before and also spent lots of time with Google trying to plan our trip so it would be enjoyable to the youngest in our party (age 6) as well as the oldest. We stayed in Vacaville, a city with a delightful downtown which was conveniently located about an hour away from Napa Valley. At the recommendation of a local, we ate a fabulous lunch at Joe's Creekside Cafe, a restaurant in an historic old post office. Highly recommended! The Jelly Belly factory in Fairfield is just 20 minutes from Vacaville on the way to Napa, and they offer daily tours plus a huge factory store. Everyone in our group enjoyed the tour and the taste-testing! If you don't have time for the tour, just stop by to enjoy the store (I dare you to try the barf jelly bean)! Budweiser (almost across the street from Jelly Belly) also offers tours from 10-4, but we weren't able to work in that one. 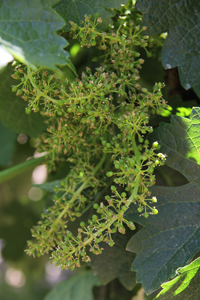 In wine country, most of the things we wanted to see were in north Napa Valley in the Calistoga area. The road going up Napa Valley is 2-lane and filled with heavy traffic, but the drive is beautiful. We had planned on visiting Castello di Amorosa since we thought the castle intriguing (and because we'd read this), but because we had been in the car for awhile due to road construction and general traffic, we decided to head straight to Sterling Vineyards since we were sure their aerial tram would interest the kids. It did! The views were stunning, and the self-guided tour of the winery was very informative. Photo ops abound. No one in our party particularly cared for the wine, however. We ate lunch at a local restaurant in Calistoga, Mary's Home Plate Cafe. It doesn't cater to tourists, as the atmosphere suggests, but the food was good. Next stop was Old Faithful Geyser (get your coupon here). It certainly can't be described as a classy joint, but the kids enjoyed it. They enjoyed the petting zoo more than the geyser (which erupts faithfully, about every 10 minutes), but at least now they can say they've seen a real geyser. 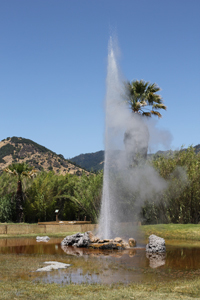 Hopefully, this stop made the science lesson on geysers a little more personal. 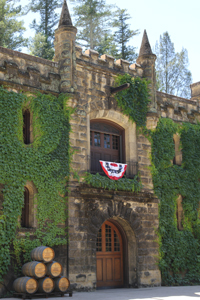 Just down the road from Old Faithful Geyser, Chateau Montelena Winery is a great little winery tucked away on Tubbs Lane in Calistoga. The grounds are beautiful with Asian inspired gardens and walkways which distracted the kids long enough for us to get our tasting. By the time they were begging to go, we were making our purchases and heading out anyway. The wine is definitely worth seeking out. Last stop in the Napa Valley was The Petrified Forest on the aptly named Petrified Forest Road (get your coupon here). Years ago, a violent volcanic blast blew down giant trees which were petrified when the volcanic ash and mud covered them. Discovered in the 1800s, the trees are now on display via a shaded, relatively easy, and enjoyable walk. Great stop! Napa Valley wrapped up our Northern California road trip which we had thoroughly enjoyed. If you missed them, read about our tour of San Francisco in 36 hours, our North Coast road trip, and our time in the Shasta-Cascade region. From the North Coast, our family took the curvy Highway 299, the Trinity Scenic Byway, to Redding. Due to road construction, the route took considerably longer than we had anticipated, but the route was breath-taking and there are pull off options periodically for breaks or photo ops. We stayed in a Red Bluff Hampton Inn, which was a little cheaper than Redding, but not too far out since Lassen Volcanic National Park was on the agenda for the next day. Although mid-May is not the ideal time to visit Lassen since the road through the park is often still closed due to snow, we still headed out early the next morning and were able to drive into the park as far as Devastated Area which awarded us with gorgeous views of Mt. Lassen. As we arrived, some daring skiers were packing up their gear with plans to ski down the mountain! Wow! After Devastated Area, we walked the lava tube in Lassen National Forest known as Subway Cave. Thankfully, we brought a flashlight because it was pitch black and the footing was uneven. It was a unique thing to see, however, and was a quick walk. Last stop in Lassen was Butte Lake. 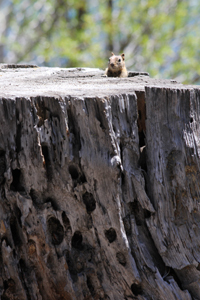 The site is about 6 miles down a gravel road, and although we saw mule deer and curious chipmunks, the views of the lake weren't spectacular. Perhaps we could have hiked to a better viewing area, but our group (ages 6 to 69) were tired from the day and not feeling too adventurous by that point. On the way down the mountain, we stopped at Pioneer Hillside Pizza, a local eatery that had good pizza in an environment that would bring out the germ-a-phobe in most anyone. After lunch, we stopped by the Mt. Shasta Mall to get some See's Candy since it's not readily available where we're from. We passed on a visit to the Sundial Bridge and of the other attractions in Redding (like this or this) and just returned to the hotel. Leaving town the next morning, we got educated on olive oils by the helpful staff at Lucero Olive Oil in Corning, the olive oil capital of the world. The mill wasn't processing olives (that happens October through January), but there were many varieties of olive oils and balsamic vinegars available to taste (yum!) and purchase ($100 or more gets free shipping!). A local told us to visit the Olive Pit as well, but we decided to save that for another visit. Our Northern California road trip was almost over. The Napa Valley area was next! If you missed part one (San Francisco), see here, and for part two (North Coast), see here. After spending the last 36 hours in the San Francisco area, we headed up the North Coast toward Point Reyes National Seashore. We had hoped to spend more time at Point Reyes, but because we were delayed due to the San Francisco Bay to Breakers 12K and 101 road construction, our time was cut short. 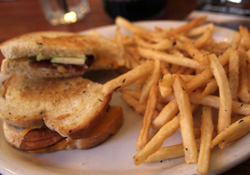 Coming in on Sir Francis Drake Boulevard, we found the Farm House Deli in Olema. The food was local, fresh, and delicious! Our 8-year-old declared the chicken fingers the best he'd ever tasted, and he's something of an aficionado. Since we only had time for one stop at Point Reyes, we chose the remote McClures Beach. It turned out to be an excellent choice! The trail was downhill toward the beach and covered with loose sand so a walking stick would have been helpful, but we all made it without incident. The beach views were magnificent -- definitely different than the South Carolina beaches we are familiar with. 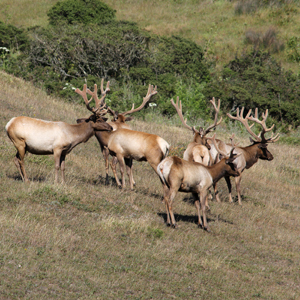 With careful eyes on the way to or from the beach, we were able to see some of the tule elk that were reintroduced into the area in 1999. The impressive creatures appear to be thriving. Leaving Point Reyes and grabbing a quick bite and fill-up in Petaluma, we readied for the long drive to Arcata. We had hoped to drive through the Avenue of Giants on the way up, but due to all our delays, we knew we weren't going to make it before dark. We were a little disappointed but figured we'd get our fill of redwoods the following day. The drive is pretty remote, so a brief stop in Willits at the local McDonald's provided our last rest stop before Arcata. After a good night's rest at Arcata's Hampton Inn, we headed up Highway 101 north to the Redwood National Park. We took the scenic Patrick's Point Drive which led us by Patrick's Point State Park. Paying the $8 entry fee, we chose Wedding Rock from the selection of park highlights which turned out to be a great choice! 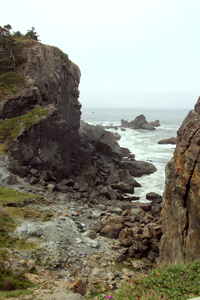 It provided gorgeous views of the Pacific Ocean via a short, easy walk from the parking lot. After lunch at the local Palm Cafe in Orick (one of the only options since we had not packed a lunch), we found the Trillium Falls trail in Redwood National Park by Elk Meadow (which was appropriately populated with Roosevelt Elk). 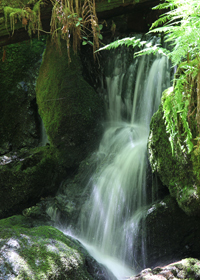 It was a beautifully stunning trail, but we turned around at the waterfall so we could move on to other park trails. We took the Newton B. Drury Scenic Parkway to Prairie Creek Trail, a wide, level trail that our boys loved. It was a little longer than we anticipated, so we cut it short to get moving further up the north coast. Next stop was Klamath River Overlook with an expansive view over the Pacific Ocean and the mouth for the Klamath River. The spot is reportedly good for whale watching (bring your binoculars), and we are pretty sure we saw one! It had been a long day, so on we drove to Crescent City for the night where we crashed at the local hotel, The Lighthouse Inn. Dinner was next door at the Northwoods Restaurant which was also locally owned and operated. Both are recommended. 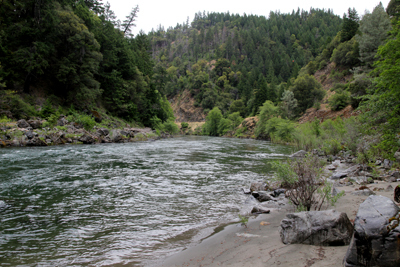 Our plan was to float down the Smith River the following day with Redwood River Trips, but much to our disappointment, we were rained out. 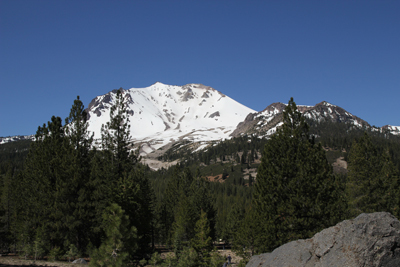 So, instead of spending the day in the hotel room, we headed on for the next leg of our journey -- the Shasta Cascade region. If you missed the first leg (San Francisco) see here. And also check out the last leg (Napa Valley) here. Before beginning our Northern California tour, we spent a day and a half in San Francisco. With such a short time and ages that spread from 6 to 69, we had to plan our trip carefully so that we would get a genuine San Francisco experience for the whole group. 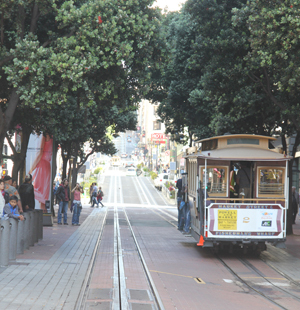 First stop, we parked near Pier 39 and took the F-line streetcar all the way to the cable car turnaround at Powell St. and Market St. We then bought cable car tickets ($6 each) and waited for the scenic Powell-Hyde line cable car that would take us back to Fisherman's Wharf. Here's a great map of the route. The wait in line for the cable car was about 45 minutes, but there was plenty to keep everyone occupied by watching the cars arrive and turn around on the turntable (and let's not forget the people-watching!). Most folks waiting in line must have read the same cable car advice we had, because the not-quite-as-scenic Powell-Mason cable car left the turnaround virtually empty every time. On the walk back toward Pier 33 (where the Alcatraz tour boat departs), we stopped at Cioppino's, a local restaurant, for some delicious local fare. top, but the audio tour of the prison is thorough and well-done. It was a little long for our younger two, but they still really enjoyed it. From departure to return, the trip was 3 hours, but we could have stayed longer if we'd been more leisurely. To finish off the day, we strolled through the shops Pier 39 and ate supper at Bubba Gump's (Pier 39's parking garage will validate parking for lunch and dinner receipts). And of course we took time to watch the famous Pier 39 seals! One our way out of town the next day, we wished we had checked a city events calendar. We got stuck in major traffic for the Bay to Breakers 12K. The route chops the city in half, making it very difficult to get across to the Golden Gate Bridge. From our observation, it seems most "racers" seem more interested in crazy costumes than in racing, so in addition to an impromptu tour of the city, we also got to see quite a variety of costumes (including one wearing his birthday suit)! After crossing the Golden Gate Bridge, we pulled off at Vista Point briefly for a few photos of the bridge. 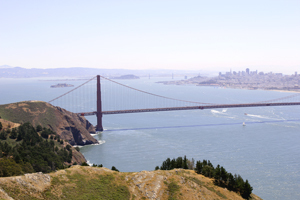 Then we took the Alexander Road exit to access the breathtaking bridge views from the Marin Headlands on the west side. Here's a great map of the area. Although we could have spent a lot of time in the Marin Headlands (it's beautiful), we were headed north to Point Reyes National Seashore and redwood country, so we didn't have time. We packed about as much family-friendly San Francisco into 36 hours as we could, so we headed on to leg two of our road trip -- the North Coast. You can also read about leg three (Shasta-Cascade) and leg four (Napa Valley). Got a long road trip or plane flight planned for the family? Here are some ideas we used that might help you keep your kids occupied. 1) Travel-sized games like Guess Who? or Trouble. 2) Road Trip scavenger hunt, Battleship or other printable games. Bring along a clipboard to make writing easy. 3) Mad Libs, of course. 4) Highlights' Puzzle Buzz or Puzzlemania are packed with fun, colorful activities that my kids have loved. These are good for waiting rooms and rainy days too! 5) The National Geographic Kids Ultimate U.S. Road Trip Atlas has a spread on each state including a map and fun facts. 6) If you have a tablet, load up on some fun apps! We like Stack the States, Stack the Countries, and Presidents vs. Aliens because they educate while they entertain. And then there's Survivalcraft that's not quite as educational but does keep the kids busy until the battery runs dead! 7) And don't forget books! Here are some fun books for boys, and here are some fun books for girls. Or, if you need a reading list for boys or girls with a little more substance, try this list.